A recent trip to the Bahamas for exhibition games was about more than fun in the sun for the University of Kentucky men’s basketball team. It was an opportunity for the Wildcats to take their social-media game to the next level. 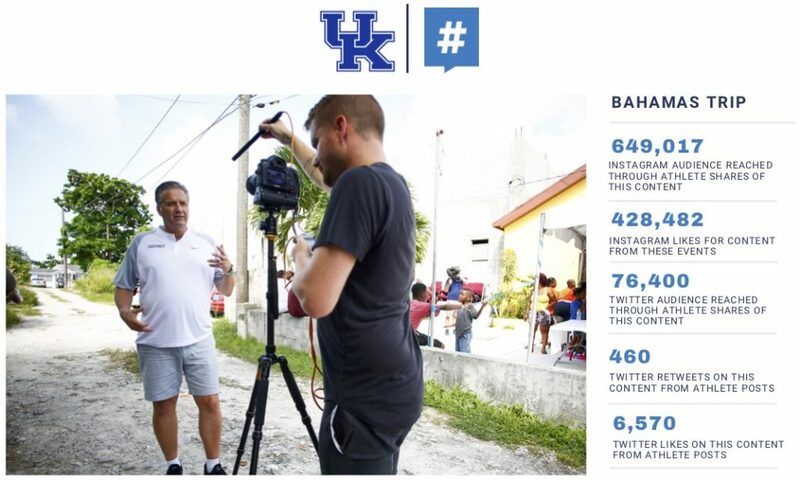 Using their Influencer (INFLCR) platform, Kentucky players accessed all the great content produced by the university during the trip through their personal INFLCR mobile app. They then could easily use that content to tell their stories of the trip to hundreds of thousands of followers across their collective social media channels. Photos, videos and more — uploaded to the INFLCR mobile app where players and staff could access personalized galleries — were viewed by thousands of fans. As a result, UK players grew their own personal brands within the context of the Kentucky basketball brand. It was a win-win for all. “Our philosophy with social media and our student-athletes, whether it’s the Bahamas trip, a regular-season game or practice, is to empower them and help them build their brand,” says Eric Lindsey, UK’s Director of Athletics Communications and Public Relations. “We don’t shy away from social media at Kentucky because we understand the importance it has in today’s world. So our approach is to give our student-athletes the tools to use if effectively. INFLCR has quickly become an important tool for those goals, with the success of the Bahamas trip validating UK’s investment in the INFLCR software and client services that come with it. On Instagram, for example, UK content shared by players via INFLCR received more than 428,000 likes. “Our problem in the past was we couldn’t find an effective way to get that content for distribution into the hands of the stars of the content. We were able to distribute on our @KentuckyMBB platforms, but the brand is so much bigger than that. With INFLCR, we’re now able to get that content easily and successfully right into the hands of the student-athletes. Kentucky is beginning its second season with INFLCR. The Wildcats are among a client list that includes programs from the SEC, Big Ten, Big 12, ACC, American, Mountain West, Conference USA and Sun Belt conferences. That is exactly why INFLCR was created, CEO Jim Cavale said, and he’s especially proud to see Kentucky — INFLCR’s first client — experience the value in a powerful way as the Wildcats begin their second season using the INFLCR software. “Kentucky Basketball is obviously one of the biggest brands in all of college sports, not just basketball,” Cavale says. “We’re so proud to have them as our first-ever client when we launched this company a little more than one year ago. “As our first client, they had to endure what any first adopter would endure with a new product like INFLCR, and be the first to use it. By being first to use it, they taught us a bunch from the use-case with them last year that got us and our product to the wonderful place that we are right now. “We continue to experience growing user engagement by the student-athletes from our 15 clients in the college athletics ranks, and our clients in the other ranks like cities, political parties and non-profits. Cavale, one of the leading experts on personal branding in the nation, has provided one-on-one coaching to Kentucky players as part of INFLCR’s service to UK. That coaching bore fruit in the form of thousands of new followers on social media for Wildcats players during the trip. “They had content at their fingertips and were able to tell their personal story in the context of the Kentucky basketball story of going to the Bahamas with staff from athletics, and coaches and a lot of the fans, and just being together, playing basketball and showing off what this amazing team already looks like before the season starts,” Cavale said. “I really want to give a shout-out to Coach (John) Calipari for creating an agenda for this trip that went way beyond basketball. One of the biggest things we tell these guys is, ‘hey, as a student-athlete, for these four years, you have a documentary camera crew following you around doing everything you do. Knowing that crew is there to document them, not just playing basketball and practicing but being out on the boat together, serving with Samaritan’s Feet … the things they did on their agenda were things that showed camaraderie, service, humanity of each of the players. That’s what people want to see, and that’s what they showed. Learn more about INFLCR and book a demo here.